Michael Shay's Hummingbirdminds: Trump Chicken asks: Where are Trump's missing tax returns? Trump Chicken asks: Where are Trump's missing tax returns? 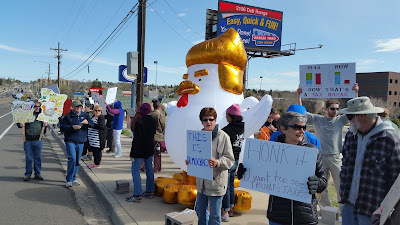 The Trump Chump Chicken was the centerpiece of the Tax March rally today in Cheyenne. The building in the right background is IRS HQ. Some 150 rally attendees in Cheyenne, plus tens of thousands all over the country, request that Trump release his tax returns because we suspect shady dealings with Russia and almost any other entity on the planet. As one sign said, "No tax reform without tax returns." Creative people, creative signs. Next Saturday, April 22: March for Science in Laramie. Will you be there?